Aristocrat is a leading name in the industry of online gambling. This casino game manufacturer is known for supplying internet gambling sites with the most remarkable slots, one of which is Buffalo Slot machine. This game was once highly popular in brick-and-mortar casinos. Becoming available for online playing, its popularity rose even more. This is an exciting, fast-paced and highly entertaining game worth trying. The slot is a part of Aristocrat's Xtra Reel Power family of slots. With this said, there are no paylines but as many as 1024 ways to win cash. Winnings are formed from left to right on adjacent reels. To play Buffalo popular online slot, a player needs to invest 40 credits. This way all five reels will be purchased and activated. This means that when launching the game, a player doesn't choose the paylines. Instead, he can choose the reels to play with an amount set per each reel. For instance, the first reel costs 1x, the first two reels together cost 5x, the first three reels together are worth 10x, choosing the reels from one to four will cost 20x, and finally, the activation cost for all five reels together is 40x. There are four symbols on every reel. The RTP (return to player) ratio is far not bad - 94.85%. Hence, your chances to get some cash are quite high in this game. Anyway, before launching the game on the real money format, you can try to gain some practice playing it for free. However, it's highly recommended not to spend much time playing for free, as there's nothing worse than seeing an entire screen filled with Buffalo symbols and realizing the winning won't be real! In all cases, you will need to register an account to access Buffalo slot machine. The basic symbol of the game is Buffalo. Yet, though the whole game look is based on the image of this gigantic mammals, there are also thirteen other symbols present in the game. The graphics of the game are bright and impressive with an abundance of purple and dark hues. The reels are located on a windy field under a charming sunset. The low-paying symbols are playing cards from 9 to A, while higher paying ones are representatives of wildlife. The game has such symbols as puma, an eagle, a stag, and a wolf. Obviously, buffalo is used as the highest paying one. This is a stacked icon, hence can appear on one and the same reel many times. In fact, it's even possible to get an entire screen of Buffalos! Once you get it as a part of a winning combination, you will be so blessed! Buffalo Slot by Aristocrat has two special symbols - the wild and the scatter. The first is pictured via a beautiful sunset. It's capable of substituting any other icon on the reel, thus creating winning combos. Anyway, it can do nothing with the scatter, which is even more beneficial! The wild Sunset can be seen only on the second, third and fourth reels. Additionally, in a free spins round, this icon acts as both a wild and a multiplier. What concerns the scatter symbol, this is presented as a gold coin. It can appear and play on any reel unlike the wild. If three or four gold coins are seen on the screen, their position plays no role. And finally, this icon can initiate the Free Spins Bonus feature. To active a round of free spins, a player needs to land three, four or five scatter symbols, i.e. Gold Coins. This will bring him 8, 15 or 20 free spins respectively. These games are much like the base game of Buffalo slot, yet with two extra features. By spinning up two scatters regardless of their position using any two reels, you can get an additional five free rounds. According to the second extra feature, by landing a wild icon during a free spin round, you will have your winning multiplied by two or three. This means that the total win for any spin during the bonus round can be multiplied by up to 27x! Agree that this is simply awesome! And finally, by spinning three or four scatters during these free rounds, they will be re-triggered. 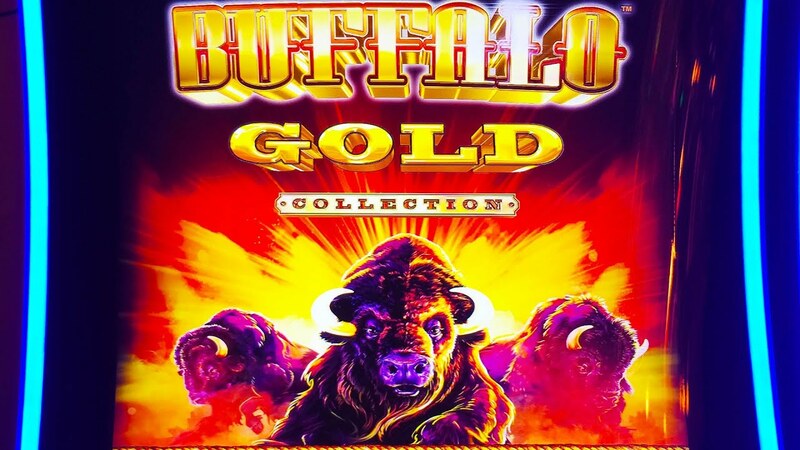 Buffalo slot game developed by Aristocrat software, is widely played as on desktop so on mobile devices. Though the title of the game is Buffalo, this animal makes only a part of the symbols - in fact, it's the highest paying one. The game is rather devoted to the wildlife with wild animals taking the roles of higher paying icons. Nevertheless, what the game promises to impress you with the most, is the Free Spins Bonus game. The latter can give you up to twenty free rounds which, in their turn, provide players with real chances of winning cash! Besides, scatters fall on to the reels quite often. Particularly this feature ensures the fast pace of the buffalo Slot machine by Aristocrat Gaming!